Yet another good night of meteor watching by the SALSA3 video system. Meteor totals increased by 2 to 47 over the previous night. Though the number of Southern Delta Aquariids (SDA) dropped from 7 to 2, the Perseids (PER) continue their steady climb to next week’s peak as their nightly number increased from 17 to 25. The system also started monitoring a new meteor shower, the Mu Perseids (MPR). Though the MPR are located close to the radiant of the major PER shower (and it is possible that these are PER that were misidentified by the MetRec software), they have different orbits from the PER. The shower was only recognized in 2012 by Japanese video meteor watchers. 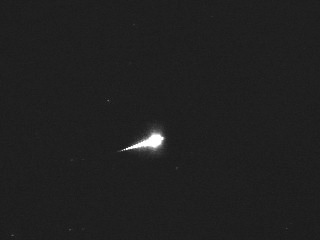 The best meteor of the night was this Perseid from 10:30 UT.